After the attack on El Queda in Afghanistan, The Dentist Dr. James Rolfe of the Santa Barbara area was inspired to help the widows and orphans there. He felt our country needed to give them something besides bullets, so he set out to make his dream come true. 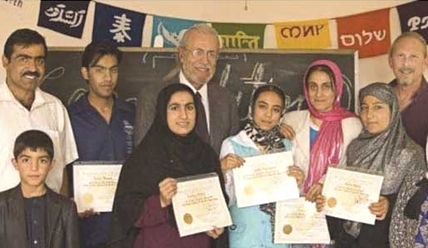 The UNA-USA San Fernando Valley Chapter worked, about 5 years ago, with the Mid San Fernando Valley Rotary to raise $6,000.00 to buy a container and other expenses for the Afghan Dental Relief Project. Dr. James Rolfe came to present a program later to our UNA group telling of the progress that had been made with that project. And, about 2 years ago we again worked with Rotary to present an “Art of Afghanistan” program where Dr. Rolfe again spoke and $3,500.00 was raised. The Dental Clinic, with the help of Kabul Rotary Club, is in Kabul. Three Afghan dentists have been hired and now work in that clinic. They have trained at least one class of dental assistants, and now have just graduated the first class of dental hygienists. Training of the first class of dental technicians is ongoing. In 2000, there was only one dentist in the whole country that had an x-ray machine; these are great first achievements. Afghanistan had about 134 dentists, but no auxiliary personnel, and these people can begin the uplifting of dental services in that poor country. But more materials and personnel are needed. Another container filled with dental supplies and equipment is almost filled in Santa Barbara, but transportation will cost about $8,000.00. and Dr. Rolfe has written to ask if our groups could possibly help with a fundraiser. Above left you will see Dr. Rolfe’s “Full-Service” Dental facility in a shipping container and above right, one of the dentists working on a patient.